A huge number of posters, campaigning for both sides, have been vandalised and removed in recent weeks. Dublin Fire Brigade (DFB) took to social media on Saturday evening to share images of a recent callout of theirs which involved the setting alight of posters advocating for referendum votes. A crew from Phibsborough Fire Station were called to the city centre to extinguish posters campaigning for votes in the upcoming abortion referendum which had been lit ablaze. DFB’s social media team took to Twitter to share images of the posters which were tied to street lamps at the time. “Last night a crew from Phibsborough extinguished referendum posters set alight on Dublin City Council public street lights,” the tweet says. The topic of such posters has been brought up numerous times in both public and private spaces, with the ESB chiming in stating that any abortion referendum posters attached to electricity poles will be removed. Dublin City Council has received numerous complaints about posters related to the Eighth Amendment referendum, with the majority of complaints focused on the content of the posters themselves. However, authorities are only licensed to remove a poster if it’s hung incorrectly or doesn’t have its publisher’s name and address on it. The council does not have any power to control what appears across the signs. Speaking about their controversial referendum posters, Cora Sherlock, spokesperson for LoveBoth, said that she believes that unrestricted abortion has nothing to do with healthcare. “Our first poster focuses on the development of the unborn baby and touches on key milestones at the beginning of a baby’s life,” Sherlock said. A number of instances have been reported in which members of the public have been spotted tearing down campaign posters in an act of vandalism. Just three months ago, Down Syndrome Ireland released a statement condemning the use of children with Down Syndrome on pamphlets and posters set to be used by the Pro-Life movement. 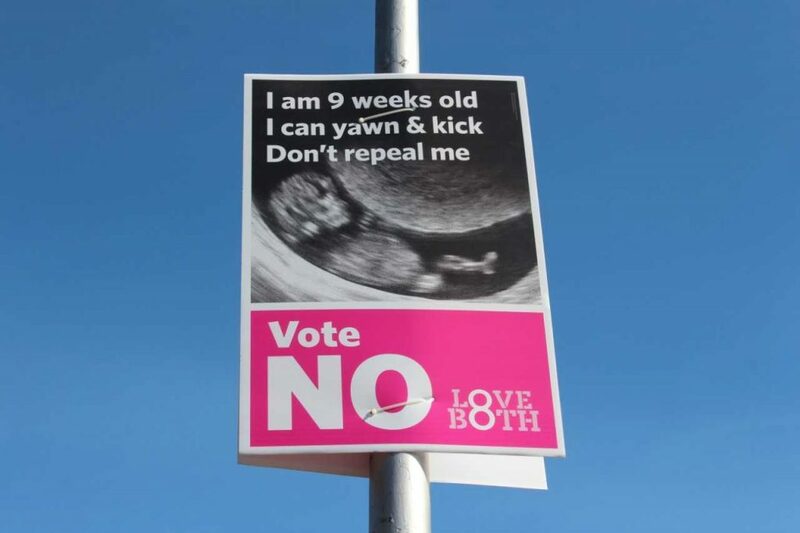 It’s believed that the use of such a child in campaign posters is targeting those in favour of repealing the Eighth Amendment, insinuating that they are in favour of ‘screening out’ people with disabilities through abortion. Just this week, a Maser mural which depicts a heart with the word ‘Repeal’ inscribed inside has been reinstated on the walls of Dublin city centre for a third time, following the removal of such twice by Dublin City Council and the Charities Regulator.